ABC Pediatrics is excited to announce another summer promotion for our school-age patients! We’d like to reserve your child’s school preparatory visit NOW to avoid the big rush just before school starts this fall! By taking advantage of our available appointments during our Summer season (June 12th thru August 11th, 2017), your child will be entered into a drawing for a BACKYARD SUMMER PARTY!! In partnership with 4-Kid-Infatables, ABC Pediatrics is excited to offer a backyard party package to one lucky patient scheduled in each of the four appointment category types listed below! EVERY school preparatory appointment scheduled during our Summer season will be eligible for the drawing. 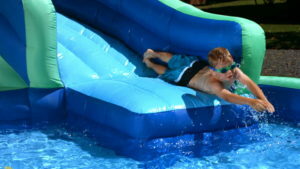 Packages include rental, delivery and pickup of a high quality inflatable waterslide to the location of your choice as well as a handy gift card for purchasing other party essentials! BACK YARD SUMMER PARTY on us! Remember, you can make appointment requests through our Patient Portal as well. Go to www.abcpediatrics.org and click on the “Patient Portal” link in the upper right hand corner. My granddaughter Katrina Secor had an appointment on July 18th. Is she entered in the contest? We don’t go back until October. Hi Annette. yes, she will be entered. Thanks for asking.